Marketing is hard. Let us do it for you. 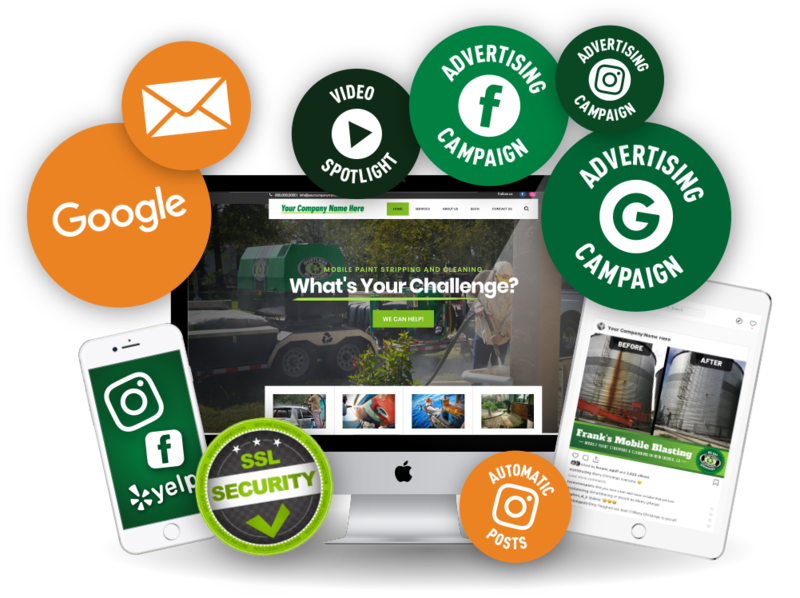 Building brand awareness is key to growing your business, and we have everything you need to attract and retain customers. 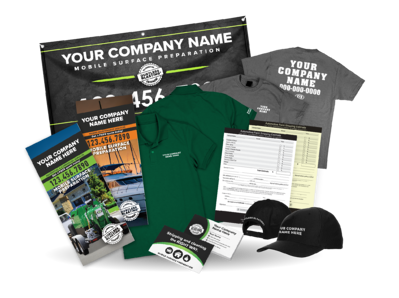 With trifold brochures, t-shirts, hats, quote forms, and more, you'll attract customers with a professional and polished image. Your potential customers are looking online for services like yours. Stand out with a custom website, targeted video ads, and more. We support you from start to finish. Even before you pick up your machine, use our professional marketing materials to advertise your new business. Customized and shipped right to your door. We'll teach you how to use your Dustless Blasting® machine like a pro, and continue to provide online support and tips for the lifetime of your machine. Get out there and start working for yourself! You're the boss, so you get to set your own hours, choose your own projects, and make your own decisions. When we set up your website and social media profiles, it's easy for your customers to leave good reviews and recommend you to others. "The team polo shirts and t-shirts are great, not to mention cards, brochures, pens, yard signs, truck signs, banner, video, etc. Really makes you look like you've got it together." "I think it's a huge tool to have right away. [It takes time] to find a local web designer, a designer for your brochures, business cards, and banner. Then the time you're going to spend with them educating them on what we do.... on and on. You could take that same time with a handful of professionally done marketing materials and go talk to people." "I purchased the marketing package and it's where I get 95% of my work." Who can use Dustless Blasting® Marketing Services™? The Online Presence packages are only available to owners of new, mobile machines. Those who own standalone blast pots, or who have purchased our equipment secondhand, are ineligible. However, anyone can purchase marketing materials from our online store! 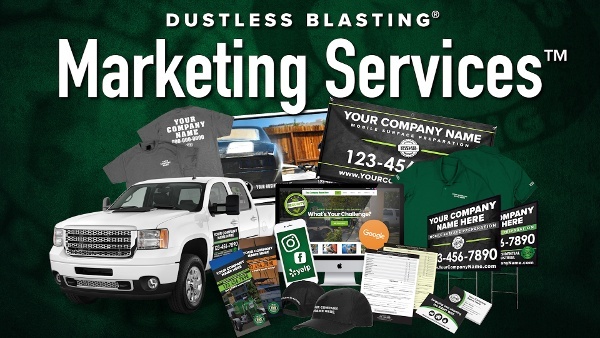 When can I purchase the Dustless Blasting® Marketing Services™? You can purchase the Online Presence package up to one year after your equipment purchase. However, there is no time limit on purchasing marketing materials from our online store. Can I finance a Dustless Blasting® Marketing Package™? In some cases, you can finance the marketing package along with your mobile equipment if you purchase them at the same time. Am I required to use Dustless Blasting® Marketing Services™? We do not require our contractors to purchase marketing materials, but highly recommend it. Having a strong business awareness is the single best way to find customers and grow your business. We provide materials which professionally describe your services. As the experts on surface preparation, we know the best ways to promote you to your potential customers. Plus, our available ad campaigns and website optimization allow people to easily find you in search results. If you have a logo for your business, you can include it on your website and online graphics. Just send us an email to let us know. The online presence packages will be completed within 2 weeks of purchase. The printed materials will arrive within 15 business days.